It was a tough road but you are a Cancer Survivor. Share your story, so that you can create additional Ovarian Cancer Awareness, by wearing your own Personalized Cancer Survivor Shirt. This is a beautiful gift for your Mom, Grandma, Sister or Best Friend. 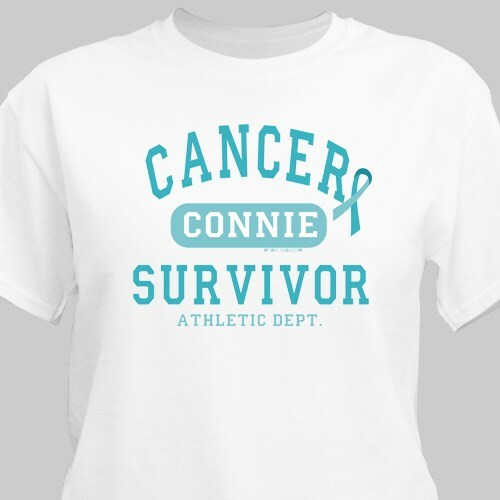 Our Ovarian Cancer Awareness Personalized T-shirt is available on our premium white 100% cotton T-Shirt, machine washable in adult sizes S-3XL. Also available on Ash Gray. Includes FREE Personalization! Personalized your Cancer Survivor Shirt with any name. January is Cervical Cancer Awareness Month. Share what you know! September is Ovarian Cancer Awareness Month. Share what you know! The shirt is great I would have rather had a shirt the didn't have the plastic lettering. I like the silk screen lettering. But I am happy to have the shirt.